Sorting laundry can be a pain, but it’s worth the extra effort. All you need are a few tips for sorting laundry to get you started. We all know it’s true—sorting clothes is an essential step in doing your laundry. But many of us neglect to do it because we feel like we either don’t have time or don’t know how to do it (or both). The truth is, sorting laundry is easy and doesn’t take much extra time to do. In fact, sorting your clothes before you head to the laundromat can actually save you time in the long run. Whites—white undershirts, white underwear, white socks, white everything. Darks—blacks, grays, navy blues, dark purples, reds, and other dark clothing. Lights—lavenders, pinks, light blues, light greens, yellows, and other pastels. Once your laundry is sorted by color, you can feel free to wash each load with the optimal cycle type and water temperature. You may have never thought of it, but sorting your laundry by weight can be helpful when it comes time to dry a load. 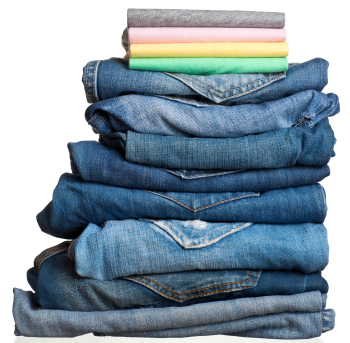 Heavier garments like jeans and towels take longer to dry than thinner fabrics, so you’ll be over drying some clothes and under drying others if you don’t sort by weight. Save yourself some time and money at the laundromat by taking a little extra time to sort clothes by weight too. Once you’ve sorted your laundry by color and weight, you’ll want to pick out any garments that need extra help with stains. You’ll be able to keep those items in their respective loads, but you’ll definitely want to treat them ahead of time with a stain remover. Now you’re a sorting master! Don’t be afraid to wash your laundry on the right cycle type and water temperature next time you’re at the laundromat. You’ll get a cleaner clean and your clothes will last longer. We look forward to seeing you at your local NJ Laundromat soon!